During the cold weather months, I rely heavily on black and charcoal grey pants, which I wear with a variety of jackets and sweaters. In the summer, black and charcoal can look heavy, so I switch to taupe. Taupe — a word that sounds so awful — is actually a beautiful, complex color: an ingenious blend of grey and brown which, in the warmer months, looks fresh and cool with ivory. Why do I look so skeptical; is Model Directrice trying to undermine Writer Directrice? I found this jacket at a Neiman Marcus consolidation sale a number of years ago. It has a large portrait collar and some trench coat detailing (the epaulettes and cinched cuffs). 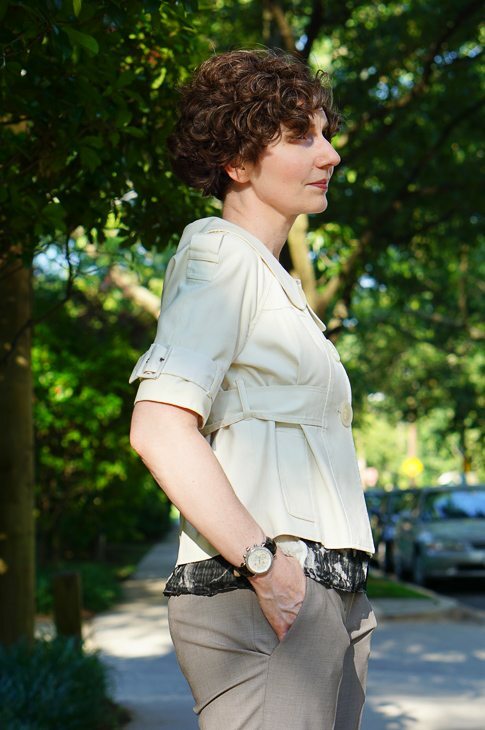 The short length is great for someone small like me and I wear it with pants (like this), over shift-style dresses, and with a long black linen skirt. But let’s dig down, because the jacket is only worn for warmth (in air-conditioning) and for meetings; the best part of this outfit is the blouse I am wearing underneath. 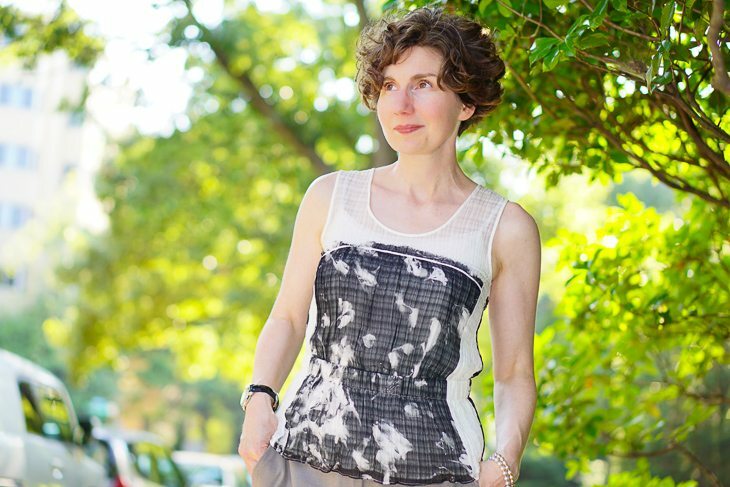 This blouse is made of a sheer, crinkly silk — a fabric that is both crisp (a little crisp) and malleable. The waist is gently cinched with covered elastic; the effect is gentle blousing, which is very feminine. I am not sure how well the details on this print can be seen in these photos — and I realize I am saying this as though I have no agency here — but the pattern is actually a black and white botanical photograph, scaled (i.e., blown-up) until it looks abstract. The blouse reminds me of the work of Rinne Allen, an Athens, GA-based photographer who specializes in food, textile, and garden photography. 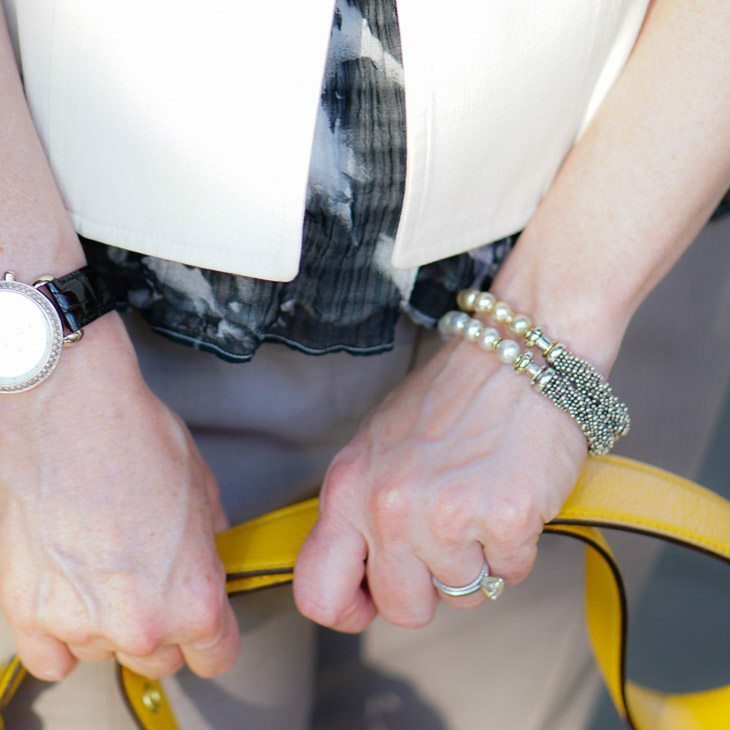 And the details — a couple of pearl and silver bracelets, a watch (with a black alligator watchband) and a yellow bag for a pop of color. For future reference: taupe’s darker shades look beautiful in the fall and winter with many shades of green, blue, pink, and lavender. I’ve loved taupe forever and am so glad to see it getting a nod. 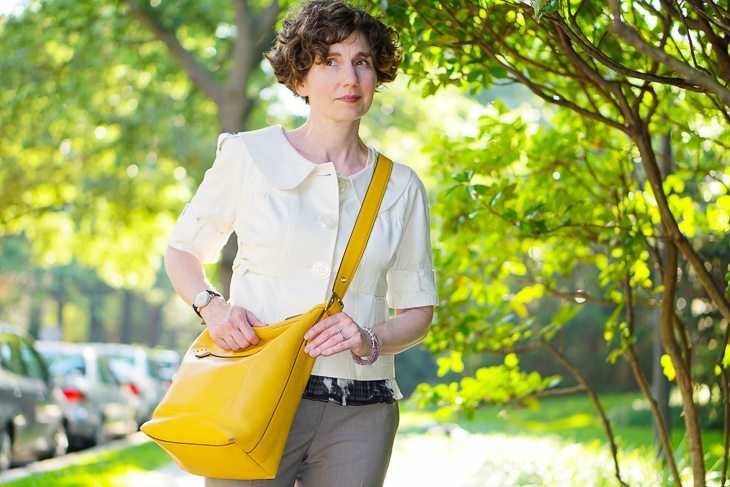 It’s a wonderful neutral for all seasons. That blouse is stunning. Love the clever back. It’s so easy to focus only on our fronts, but people see our backs just as much and maybe more. Thank you for this post. I’ve always thought of taupe as a boring color, but recently realized how lovely it looks with ivory. You’ve created such a lovely pairing with the blouse and jacket. Hi Rhizophora — I think taupe needs a foil to look its best — whether that’s another neutral (like ivory) or a jewel tone may not matter, but I think it may be a tough color to wear head to toe. I am, however, open to persuasion from taupe enthusiasts.